Flat perches designed for both healthy and disabled birds. Safe, fun and won't promote breeding. Great for special abled birds, too! Made with a 7" x 7" seagrass mat and hung with bird-safe chain adourned with little beak toys! Great for Small from Lovebids, Cockatiels, Parrotlets, Conures, etc. and similarly sized birds. Great for Small to Medium birds, from Lovebids, Cockatiels, etc. to Greys, Eclectus, and similarly sized birds. Natural Cage Corner Shelf measures 5" X 5". Made of natural pine. Birds will love to rest on the platform . An ideal place designed for your feathered friend to play and climb, easy installation. Natural Cage Corner Shelf measures 7" X 7". Made of natural pine. Birds will love to rest on the platform . An ideal place designed for your feathered friend to play and climb, easy installation. 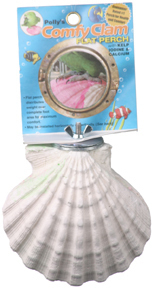 Measures 7" x 7" x 1"
The Comfy Clam Flat Perch is consumer the #1 rated perch for health and comfort. Perch is embedded with kelp, iodine and calcium. The perch distributes weight over complete foot area for maximum comfort. May be installed horizontally or vertically which offers a variety of perching options, which promotes healthy feet and leg muscles. An excellent hang-out for for birds. Great for special-abled birds.